Severe saline areas like this one can often be mitigated with successive years of full-season cover crops. Choose species that have a high-water use and are salt tolerant. The author is an extension soil health specialist at North Dakota State University. In the Northern Plains region where salts are naturally occurring even under dryland conditions, farmers are trying multiple strategies to deal with the issue. These include splitting fields, crop selection, cover crops, conservation tillage practices, soil amendments, and drainage improvements. No single approach is best; a combination of approaches is most effective, and solutions are tied to soil water management. It is important to keep in mind that there are some approaches that are not effective for the specific salt issue in a field. This makes understanding what the salt issue is and to what degree it’s occurring critical to selecting the right combination of mitigation approaches. Soil sampling is the first step to coming up with an effective plan. Poor yielding parts of the field need to be sampled and analyzed separately from the high yielding parts of the field. If salts are suspected to be the cause of low productivity, analyze soil samples for both salinity by testing soluble salts or electrical conductivity (EC) and sodicity by evaluating sodium adsorption ratio (SAR), exchangeable sodium percentage (ESP), or sodium percentage. Obtaining the soil test results will allow for the determination of what the salt issue is — saline or sodic — and lead to the selection of an effective remediation strategy. Soil samples for salinity or sodicity analysis should also be taken in increments up to 4 or 5 feet deep to know where salt concentrations are highest and where salts are likely to move in the soil profile. Information on interpreting soil test values in the Northern Plains region can be found at NDSU’s Soil Health webpage. Once you “have your numbers” and know whether you are dealing with a saline or sodic soil, chances are good that the field will have to be split for effective management and to get the highest returns possible. Salinity is often found on the headland or along a ditch that frequently holds water but can be patchy across a field in response to topography. Try to square off the saline areas to be put into a perennial crop, more salt-tolerant cash crop, or a full-season cover crop, while still growing another cash crop on the remaining “good” parts of the field. Sodicity can also be patchy across a field and should be managed differently from other parts of the field when possible. Several crops are intolerant of salts and should not be grown on saline areas. When crops fail in a saline or sodic area, start the remediation process by using barley on saline areas followed by a cover crop or a perennial to use the maximum amount of soil moisture possible. Barley can be used as an indicator of whether perennials, including alfalfa, will grow. Plant alfalfa or other forage grasses only in those areas where barley successfully establishes because salts in these areas are likely low enough that alfalfa can get established. The barley mulch may help in this regard. To use extra moisture in the spring or if field access is an issue in the spring, consider seeding cereal rye in the fall (rather than barley in the spring) so that it will establish, over winter, and have a head start on growth early in the season. Harvest the cereal rye for a forage, and then either plant barley or a perennial where the cereal rye successfully established and was able to grow (just like you would when using barley as an indicator). If including barley or cereal rye is not enough to make the soil conducive to establishing a perennial or a perennial does not fit with on-farm goals, then consider using full-season cover crops to remediate the saline areas. Again, use barley as an indicator of what will or won’t grow, and plant a cover crop directly after barley to continue using water. Picking salt tolerant, high-water use cover crops is important for saline areas. In North Dakota, we’ve had luck using radish, sunflower, and dwarf essex rapeseed with barley and cereal rye. Carefully choose only cover crops that you are comfortable controlling and won’t impact the crops being produced in the rest of the field. If the cover crops won’t grow and weeds will, then use the weeds to manage the saline area. Weeds will manage salts (via water use) when nothing else will grow, but be sure to prevent weed seed production by using a batwing mower prior to the weeds putting on seed. For sodic soils, getting organic matter back into the soil using cover crops can help improve the soil. Alfalfa grows following a barley crop on a saline soil. The barley mulch and regrowth can also be seen. Minimizing tillage on saline soils is critical to reduce evaporation and mixing of salts from lower in the profile with the surface soils. Farmers have made good progress by not tilling headlands that are impacted by salts and direct seeding their cash crop into those areas each year. This is a simple approach that does not require additional inputs. For sodic soils, tillage may be important during the initial stages of mitigation with the goal of mixing calcium or magnesium salts from deeper in the soil profile with the more sodium-rich surface soils. However, this would not be recommended without a soil test to indicate where the sodium is dominant in the soil profile. If tillage or ripping is used on sodic areas within a field, incorporating a calcium-based soil amendment like gypsum might improve the affected areas. Immediately plant a cover crop or perennial forage after ripping. Management of sodic areas can be extremely challenging. Focus on making incremental progress rather than drastic improvements. Adding amendments to saline soils does not improve conditions; however, adding a calcium amendment to a sodic soil may be beneficial. Keep in mind that productivity may not improve drastically on these areas by incorporating an amendment. It may be that trafficability is improved so that the tractor won’t sink as deep when the sodic soils are wet or that the soils won’t be as hard when dry. Spot applications of amendments for sodic soils will be less costly, but fields may require more soil testing to define these problem areas. Again, do not add or incorporate amendments to saline soils. Improving surface and/or subsurface drainage is important for both saline and sodic soil management. Ditching to keep the water moving along with improving downward movement of water (infiltration) is important to effectively manage saline soils. Keeping ditches clean both on and around fields can reduce the effects of standing water upwelling into fields and movement of salts into the rooting zone. Infiltration can be improved by reducing tillage and adding cover crops or a perennial for development of root channels and the breaking up of compacted soil layers. This can lead to salt movement deeper into the soil profile and out of the rooting zone. The installation of subsurface tile drainage can ultimately lead to salt removal. Subsurface drainage is also important for sodic soil management by allowing for removal of sodium. But in the case of sodic soils, there needs to be enough rainfall to move the sodium through the soil profile to the tile lines. This can be a barrier in climatic conditions where evaporation exceeds precipitation. The bottom line is that there is nothing simple about managing saline or sodic soils, it requires patience and persistence. Farmers are seeing success using a combination of the above approaches but have to intensively manage these areas. 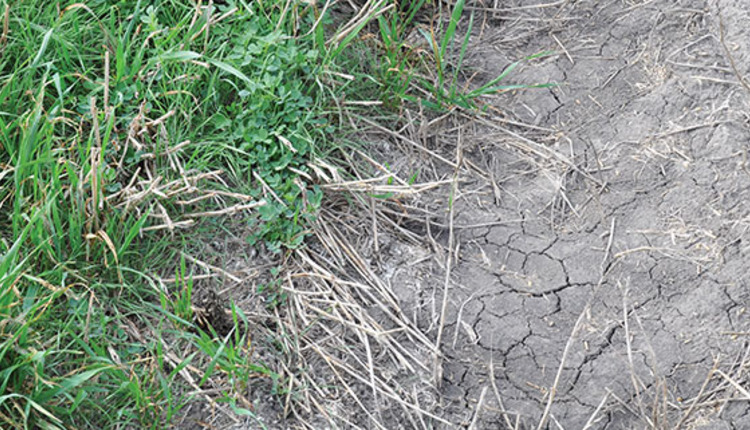 It will likely take multiple years to get something growing, and farmers should not get discouraged when they see weeds coming back into once barren saline areas. Weeds are a sign of progress and not a sign of failure — something growing is better than nothing growing. Realistic expectations are also important because these saline areas are the consequence of other characteristics of that soil or landscape position. The inherent properties causing the salinity or sodicity cannot be changed but can be managed. For more information, visit the North Dakota State University Soil Health webpage: www.ndsu.edu/soilhealth. Contributors to this article were Caley Gasch, NDSU assistant professor; Tom DeSutter, NDSU associate professor; and Lee Briese, Centrol Ag Services. This article appeared in the March 2017 issue of Hay & Forage Grower on pages 10 and 11.